Four women’s teams may have been eliminated from contention during prequarters, but they still made the bracket and can count themselves among the top 12 teams in the nation. In our Exit Survey segment, we took a look at the performances from these four teams, answering five key questions about their season and their performance at Nationals. How did they get to prequarters? Michigan struggled during the regular season and did not have much success against the rest of their competition at Nationals. They ended their season with a 22-12 record, but most of their wins were against teams that did not make it out of Regionals. This earned them an 18th seed at Nationals and some stiff competition in Pool B. However, this 18th overall seed allowed them to boast the record of being the only 5th seed to qualify for the bracket. Michigan made their way to prequarters off a gritty game against Carleton where both squads dug deep into their reserves to fight for their chance to make it out of the pool. When the dust settled, Michigan’s depth proved to be their best weapon against Syzygy, with ten of their players contributing with a goal or an assist. For all of Michigan’s heroics, they had the misfortune of meeting UNC in prequarters. UNC dropping to prequarters was already a bad sign for Michigan and it didn’t get better. The women from North Carolina threw every type of defensive trick they had against Michigan, and it worked. Flywheel coughed up two breaks early in the game and never had the defensive intensity to pressure UNC into being broken themselves. Michigan’s offense actually played fairly well throughout the game, but UNC took every inch they could and made a good case for their seed coming into Nationals. Michigan’s best game was also their closest game. After losing their opening game on Friday to UCSD, Michigan fought pound-for-pound with Carleton in a game that eventually went to double game point. The game was a nailbiter, with incredible plays from both sides and many spectacular defensive stops. In the end, Michigan pulled out the win with remarkable composure, securing their chance to make bracket play. 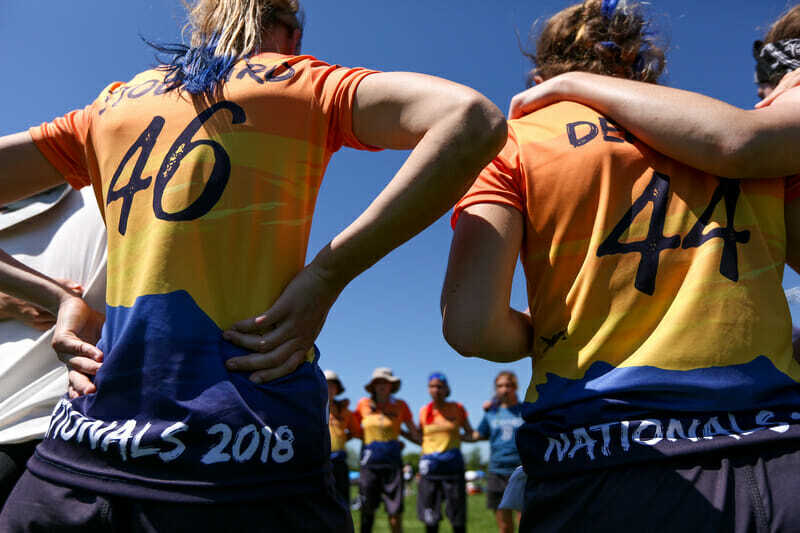 With so much of the women’s division going according to seed, Michigan’s run to bracket play was both noteworthy and refreshing. Who stood out on their team? Phoebe Hopp. While Amy Stoddard deserves a shout-out of her own, it was Hopp that was unstoppable for both of Michigan’s wins. In the game against WWU, Hopp scored five goals and had three blocks, which dwarfed the rest of her team in comparison. No player gave UCSD more trouble or put UNC under more pressure. Hopp’s most impressive stat is that she conceded only two turnovers across all of her pool games. Despite being a frequent target for Michigan, Hopp was never flustered with the disc and often made the right pass to keep possession alive. As Hopp is only a junior, it’s a near foregone conclusion that she’ll be an even greater threat for Michigan in 2019. Look out world. Michigan’s future is very uncertain. They’re graduating all of their central handlers and losing a lot of veterans heading into 2019. For most teams, this would signify a rebuilding year, and yet, we thought that about Michigan for this year, so anything is possible. NC State’s road to prequarters started with a statement win over Tufts at Queen City Tune Up. A preseason afterthought, from that moment on, it was very clear that NC State needed to be taken seriously, although the extent of their ability was still in question since the weather closed out their opportunity to finish the tournament. The questions surrounding NC State kept coming right up until Nationals. During their regular season, NC State never travelled West to compete against the elite teams on the opposite coast. Without those games, NC State was an anomaly that many teams didn’t bother to solve. This worked in NC State’s favor. “We played with a chip on our shoulder all season, and carried it into Nationals,” said Ashley Powell, NC State’s captain. From the beginning of the tournament, NC State knew their identity even when other teams didn’t. Oregon was caught napping in the first game of their pool. NC State went in with a game plan and were prepared in a way that Oregon was not. Starting the tournament with a win over Oregon was impressive, but NC State also posted solid results against Stanford (L: 15-8), OSU (L: 13-9), and Cornell (W: 14-9). Every game mattered in Pool D, and NC State earned themselves a prequarters spot over OSU by playing close enough to all the top teams in their pool, and pulling out wins when they needed it. “It wasn’t just about getting to Nationals, it was about beating teams at Nationals,” said Powell. Unfortunately, NC State met an experienced Colorado Kali squad in prequarters and couldn’t steal another win. Colorado had the depth and endurance to outlast NCSU despite the game remaining close for the entirety of the first half. The only break in the first 14 points came when Colorado punished a small execution error from NC State’s handlers to take half. NC State would continue to fight but it was clear that they were exhausted. This was the team’s first trip to Nationals in over a decade and they came up just short of an unprecedented run. There is only one answer to this question for NC State. Their win over Oregon not only set the standard for upsets in the women’s division, it gave NCSU their spot in the bracket. The Jaga Monsta team was the only fourth seed or lower to make prequarters. By beating Oregon, the fifth seed at Nationals, they earned the respect of their pool, and the entire tournament. Ashley Powell. No other player was as important to NC State’s success this weekend or this season. This was very apparent in the Colorado game, as Kali threw out a box-and-one zone that was made to contain Powell. Without their star handler, NC State’s other strong players could not shoulder the burden of running the offense, and Colorado took a number of consecutive breaks late in the game. It is tough to tell what’s next for NC State. They are losing the majority of their offense, with Ashley Powell, Alix Robbins, Briana Campbell, Becky Widmayer, and Carmen Tormey all graduating this season. Those pivotal players were responsible for almost all of NCSU’s offensive points, and it’ll be tough to recover without them. Still, they do return Rowan Jaynes, Danielle Sawyer, and Emma Bartlett. It’s also worth remembering how strong the recruitment pipeline is in North Carolina. NCSU probably won’t be able to match the same heights they reached this season right away, but if their younger players can step up and make major contributions, a return trip to Nationals is possible. Tufts was one of the few teams all season to emerge through the regular season relatively unscathed. Apart from an early double game point loss to NC State, Tufts only lost to teams who ended the regular season seeded above them. They seemed to be repeating this pattern at Nationals, until a motivated Colorado squad powered past them in the final game of pool play. Tufts drew the short straw in prequarters and had to face a fiery Oregon Fugue almost immediately after their tough loss to Colorado. Oregon was aggressive from the offset, and never allowed Tufts to develop a rhythm on offense. By the time Ewo found their footing, it was already too late. Fugue would give them chances to break back into the game, but every time Tufts seemed to gain momentum, Fugue would score with ease. Ewo’s strength throughout the season was the firepower of Megan Wilson and the downfield prowess of Hannah Crowley. It just so happened that Oregon had answers for both of Tufts’ stars and had the depth to exhaust Ewo’s stars early in the game. Tufts played the game tight right up until the end, but Oregon’s offense was too great to overcome in the end. Tufts will talk about their win over West Chester for years to come. Despite being down 8-5 at half, Ewo magnificently broke back into the game. West Chester’s lead didn’t just dwindle, it disappeared in front of their very eyes. Ewo had a four break run early in the second half and won the half 10-3! No other team at Nationals can claim such a feat. Hannah Crowley. While the rest of Ewo’s offense was consistently good, Crowley was great in almost every game Tufts played. She led her team in goals (with 16), and had only five total turnovers after pool play. That’s incredible efficient for a player with such a high usage rate. This offseason is not going to be kind to Tufts. They lose Hannah Crowley, Valerie Willocq, Megan Wilson, and Sammy Saltzman. That’s most of their offense and many players who contribute on defense, too. Tufts has always had a good pipeline, but they’ll need players like Margo Urheim and April Weintraub to take a major step up if they want to make Nationals again. UCSD’s season was as surprising as it was dominant. The Psychos notched an impressive record of 36-3. Their only losses in the regular season were to the previous two Nationals champions, Stanford and Dartmouth. In the four tournaments they played, they finished no lower than third and put the rest of the division on notice when they beat UBC to win the Stanford Invite. This earned them a pool top seed at Nationals and were riding the high of having beat Stanford at Regionals. Nationals was a completely different story for UCSD. Where the Psychos had looked comfortable and efficient all season, suddenly the impenetrable offense seemed nervous and confused. “We got nervous. Definitely didn’t play as strong as we could,” said Dena Elimelech, UCSD’s star player. One of her teammates, Samantha Wool, agreed. “Despite being the first seed, we still struggle to see ourselves at the same level as our opponents at Nationals.” Nowhere was this more apparent than in their game against Texas. Melee played with a swagger and confidence that threw UCSD off their game. Even though UCSD won every other game in their pool, the Texas loss loomed over them for all of Saturday. In a cruel twist of fate, UBC only barely made it out of their pool with the third seed. Despite being ranked sixth heading into Nationals, UBC struggled to close out close games against Pitt and UNC, ultimately losing both. But UBC came out firing in their game against UCSD. The Canadian squad was able to capitalize on UCSD’s turns and force UCSD into uncomfortable throws. It wasn’t just UBC’s strengths that won them the game. UCSD struggled to connect with their hucks all game, and Elimelech had a particularly tough game. UBC stormed out to take half at 8-3 and UCSD could not cause enough breaks to put UBC under pressure. UCSD should be proud of their win over Carleton. Despite trading for most of the first half, the Psychos kept grinding and drew from every reserve they had to win. They broke to take half and then went on an astounding four-break run at one point during the game. While UCSD admits to having some issues with their nerves, closing out games like that are the mark of a true contender. Dena Elimelech. UCSD’s deep defender and POTY candidate was integral to everything UCSD did. Her presence was felt on every point she played and the points that she didn’t play were few and far between. The most compelling case for Elimelech being their MVP was in the game against UBC. Make no mistake, Elimelech did not play well in their prequarter match-up, but that’s part of the reason why she remains their most important piece. If Elimelech is struggling, the entire team struggles. UCSD had a deep team this year, and Elimelech still played almost every point. That says a lot about how much rode on Elimelech each game. Prequarters is a tough exit for UCSD, but every player on that team will have a chance to rectify the situation in 2019. Comments on "2018 D-I College Championships: Prequarter Exit Survey (Women’s)"